Thank you for visiting The Homesteading Cottage. If you subscribe to our blog via RSS feed or email, you'll get helpful tips on simplicity, organization, all things DIY, natural cooking, entertaining, homesteading and emergency preparedness sent straight to you! 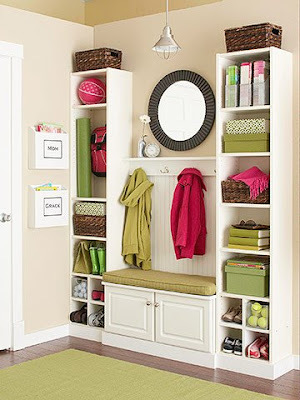 I love a good makeover and adore this idea from Better Homes and Gardens on transforming a mudroom for $324 - "An organized catchall that functions for the entire family." But in usual frugal fashion, I'm already "making over" this makeover in my mind (: I'm thrifty by nature and prefer to do something myself rather than purchase premade items. I wanted to see if it were possible to indeed bring in that same look for less. The grand total, including paint, is just a tad over $240. Not a bad reduction from that original $374 tag, plus you're getting items that weren't even on the original list. Prices always vary upon location, but this is a simple guide to get you started. If you already have some of these elements on hand, the cost would be even less! Bookcases are a simple construct from two 4'x8' sheets of MDF. Cut one sheet into (4) 1'x8' pieces (these will serve as the sides for the bookcases) and then from the other sheet, cut shelves 1' deep (to match the side pieces) and a width to suit your needs. If you're liking the narrow IKEA Billy bookcase pictured in the makeover, then each shelf would be 1'deep by approximately 16 inches wide. Depending on the width you choose, you should have quite a bit of MDF leftover from that second sheet. From the extra MDF, cut two pieces to create the simple shelf shown in the photo above. 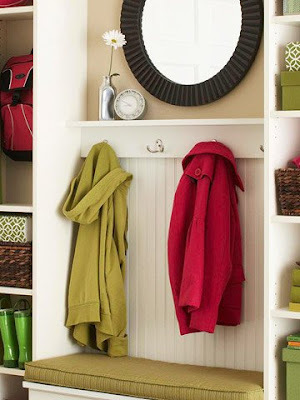 Add double hooks for coats and outdoor gear and attach to the wall. Creating the beadboard feature below the shelf is a simple trick of using lattice molding strips. You could buy beadboard wall board, but lattice strips are much more economical. For this project you should only need four 8' strips. Cut each strip in half to create 4' long pieces and space them on the wall six inches apart. Of course you might need more or less depending on your style preference. You're just trying to achieve the board and batten look You can either attach the strips with finishing nails or glue. Instead of the $93 white wall cabinet, we found the same model in an unfinished state at our local Lowe's for $58. Leftover MDF will provide the needed "seat." Cut to desired width and depth and attach on top. 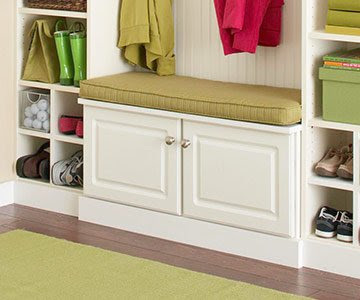 If you'd like to save that $58 and there's enough MDF, you could make a simple box bench in place of the wall cabinet. Finish things off with a pair of knobs. We found a set for $2.00, but if you have the extra hardware from previous projects, give them a facelift by applying a hammered iron finish for additional savings. Hanging wall files by the door is such a good idea! 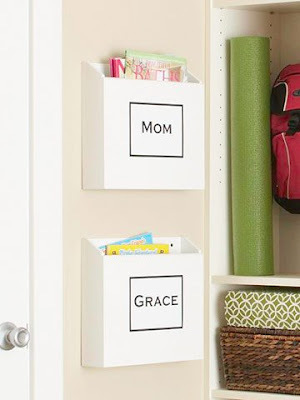 It's perfect for mail or bits and pieces that you don't want to forget as you head out the door (: For our version, we decided to create a Pocket Plaque by taking two plastic organizing pockets and mounting them on a piece of...you guessed it...leftover MDF! Each pocket costs around $10 (shipping included) and a coat of white paint will create the illusion that the individual items are all one piece. Customize by installing as many pockets as you need, glue on trim around the edge of the board to create a frame (can use leftover lattice strips for this), apply a few labels and voilà! Instant organization. We also like the added touch of a few screw hooks on the bottom of your Pocket Plaque to hang keys, dog leashes, etc. If you're really frugal and prefer a no-cost option, here's a great Ballard Designs inspired wall pocket organizer made by Nike from Thrive. 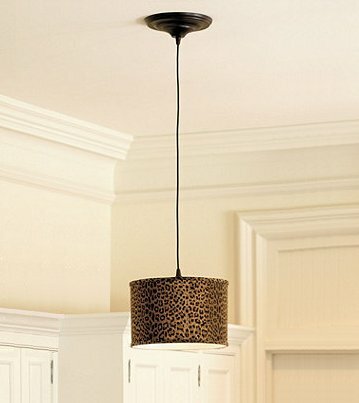 A pendant light kit paired with a barrel shade makes a thrifty substitution for the suggested $91 pendant light. Of course the artistic side of you could get even more resourceful by using items already on hand, but this is a simple example if you don't have the supplies. The cost conversion? $25! We were able to find a light kit at our local hardware store for $10 which locally gives us the cost of $20. Taylor from Living in the Woods created a similar pendant light and Sarah over at Thrifty Decor Chick completed two of these projects....one for her office and the other in her kitchen. Now for some finishing touches...We were able to find a $25 mirror at our local WalMart and 2 cute baskets to perch atop the bookcases for $13 each. 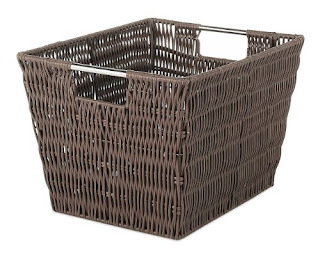 Add in your own lovelies and it's the perfect spot to keep your home running efficiently. I'm by no means giving a step-by-step construction guide for making each piece, but this just shows how creativity and elbow grease can save you some green if you're willing to build things yourself (: Do you have any frugal redo's in the making? What are some tips you've found to be helpful? I'd love to hear your thoughts. "Make it your ambition to lead a quiet life, to mind your own business and to work with your hands." "Common sense is genius dressed in its working clothes." "Miracles are a retelling in small letters of the very same story which is written across the whole world in letters too large for some of us to see." Watch your character, for it becomes your destiny." "Do not part with your dreams or aspirations for when they are gone you will still exist, but you will have ceased to live." Copyright © 2016 Natural esSCENTials LLC. All Rights Reserved. Simple theme. Powered by Blogger.